Our house needed a little something in our entryway. 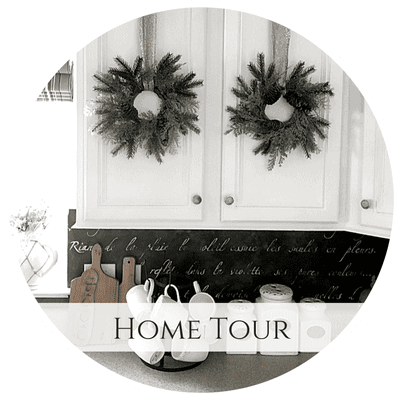 In fact, my entire blog is dedicated to giving each and every corner of our house an easy, quick and inexpensive upgrade. So if you are facing a similar dilemma…I hope you’ll stick around! 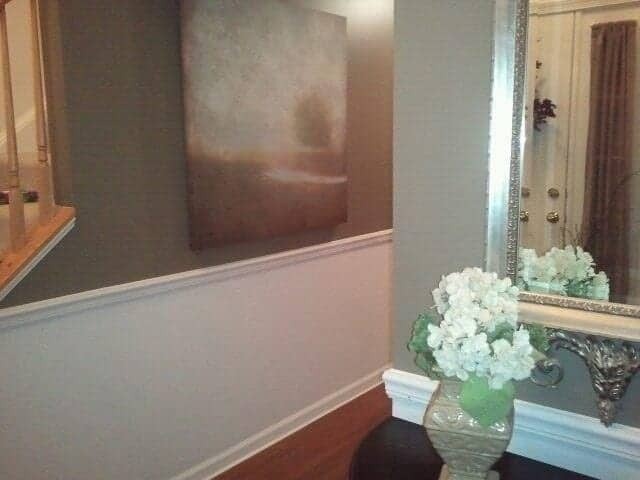 For this initial project we added wainscoting to the right and left walls in our foyer. 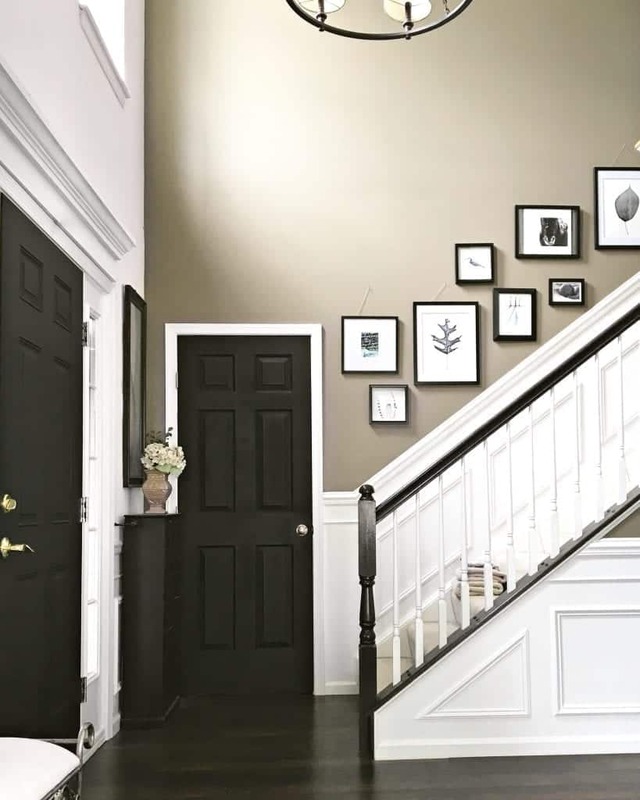 Total Cost: Depends on your space, but our initial 2 foyer walls cost under $500. Paint of your choice. We went to Home Depot and purchased Behr Semi Gloss White Interior Paint. Recommended Tutorial: I followed this tutorial. But much of our wainscoting project was just “eyeing it up” to see what looks best in our space. Eventually we added more wainscoting up the stairs but we saved that for another day. When I built this home, adding trim, crown moulding and wainscoting was a $30K “upgrade” to hire the builder to do it. So it was an easy decision to DIY this project. Instead I invested my budget in square footage upgrades in lieu of cosmetic projects that I could do myself later. After completing the project, circa 2012. Before our new floor was installed. I tackled this mostly on the weekends or at night (after work). Yes, I did this myself! What got me pretty far along was this tutorial which outlines the process pretty well. This is a very visually intuitive process. Once you master how to cut 45 degree angles and remembering which angle to cut then you’re set. Any gaps, you simply fill in with caulk and smooth it with a wet cloth. 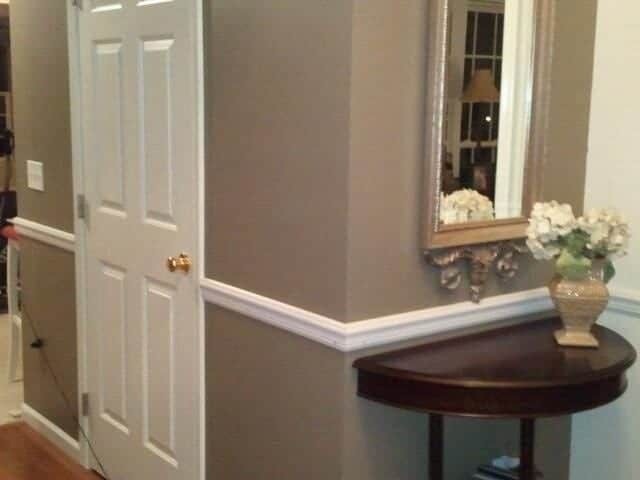 It immediately closed all the gaps and made the wainscoting look like it was part of the house for years. My trick for caulking? I use a bathroom caulk since it expands/contracts more effectively with the varying humidity inside of my home. You simply lay a bead of caulk along the gaps and corners, then use a wet cloth to push the caulk down into the gaps and create a finished seam. Then use the same rag to clean up the excess. It fills the gaps and trims out the piece beautifully. I filled the nicks in the wall with a nail filler and a scraper. Then I sanded and primed. Eventually we continued installing wainscot around the corner where the basement door is (on the right). Note the front door is still white in this picture, and the oak railing painting project hadn’t taken place (yet). As I did this project, I was shocked to find that the “studs” in the wall were not the standard distance. It was a trick finding a stud to nail into. I would highly recommend using a stud finder to avoid placing multiple holes in your walls. I drew a line on the wall, placed the chair rail. Then used glue and a nailgun for placement. I primed the wall below the chair rail. Before painting the front interior door black. This convinced me that I wanted the rest of the interior doors black. What do you think? Extending the wainscot up the stairway added to the initial cost, but what a difference! We couldn’t stop staring at the results after the first weekend we did it!! 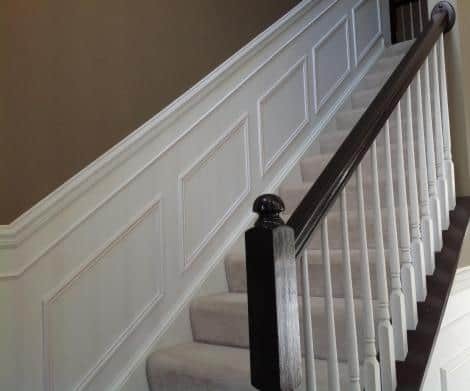 There are many varieties of wainscoting to choose from, (an entire library can be found here) but I decided to go for a more classic version with colonial trim pieces layered throughout. There was no exact science to how we did our project. 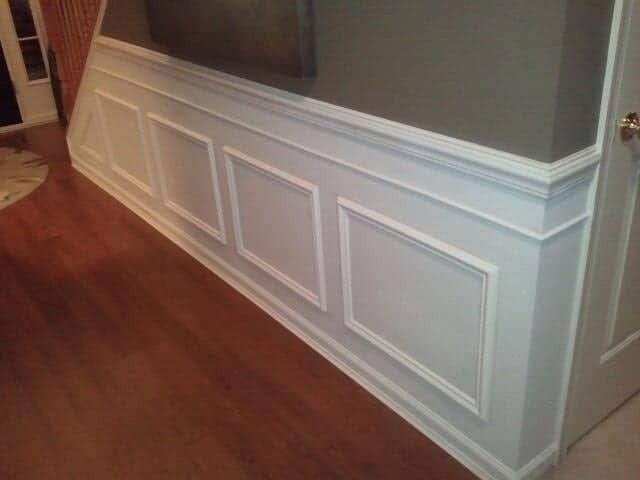 We did a lot of “eyeing up” the trim, experimenting with different layers until we ended up with the classic wainscoting look that we wanted. 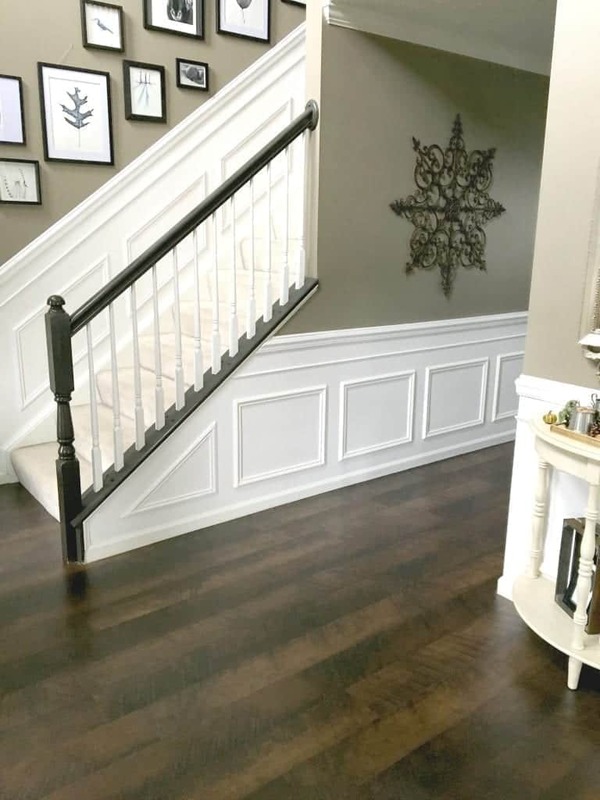 Some ask, “don’t you think wainscoting will go out of style? ?” My answer? And emphatic “NO! 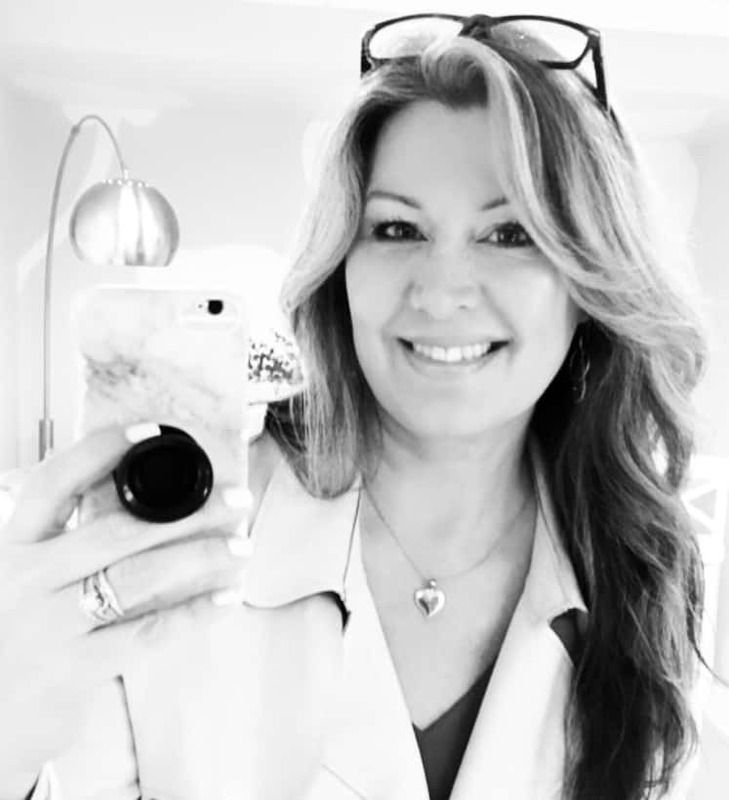 !” I’ve lived in many old brownstone apartments which were built turn of the century with not only classing wainscoting but also built-in cabinetry, arched doorways, leaded glass cabinets, old radiator steam heat. I would say this architectural style is quite possibly is here to stay. 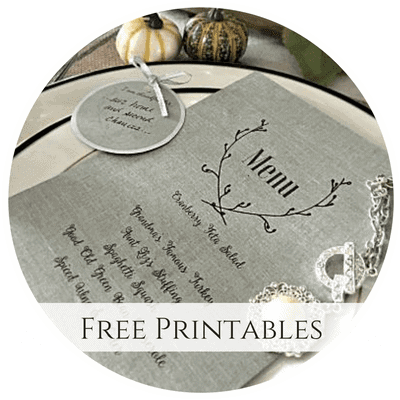 If you found this project on Pinterest or Stumbleupon, welcome! If you’re one of many people that tried out our tutorial, I’d love to see YOUR results. Post your images below and let us know if we can make any improvements to our tutorial. Good luck! Great job, Jeanette! 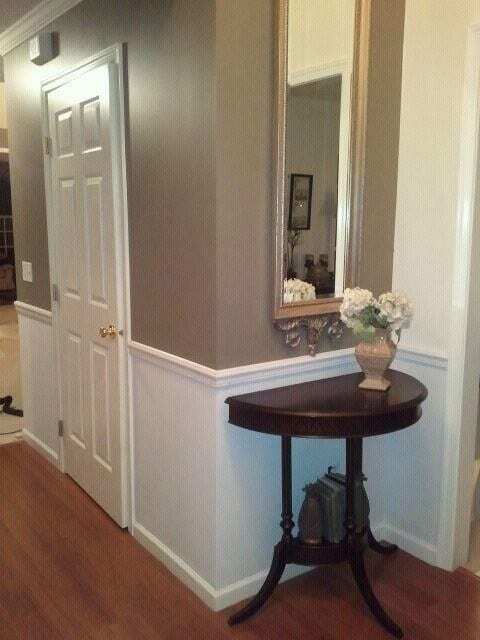 I love wainscoting and you did a FAB job. Thanks Denyse, we love it. Major upgrade, but at a very low price. Can you give me the name of your paint and brand? Is it grayish or brownish! So pretty!! 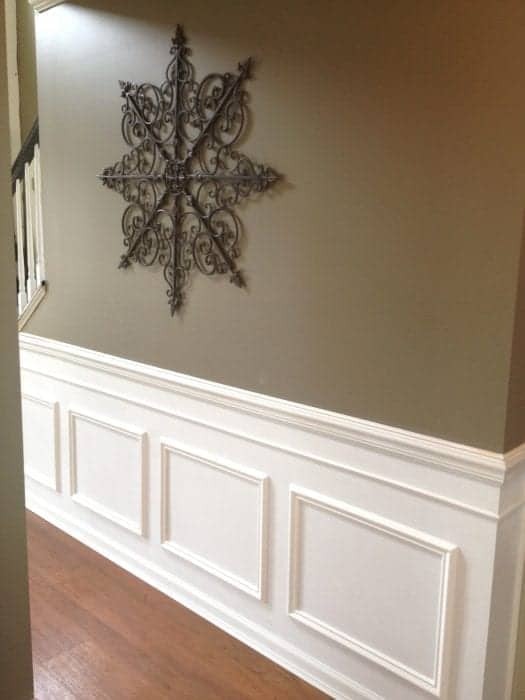 I’m a big fan of wainscoting! I want to add it to my hallway…at the very least. Once I start envisioning it in one spot, I can picture it in just about every room in our home. Thanks for the inspiration! I’m the same way, Sharon. 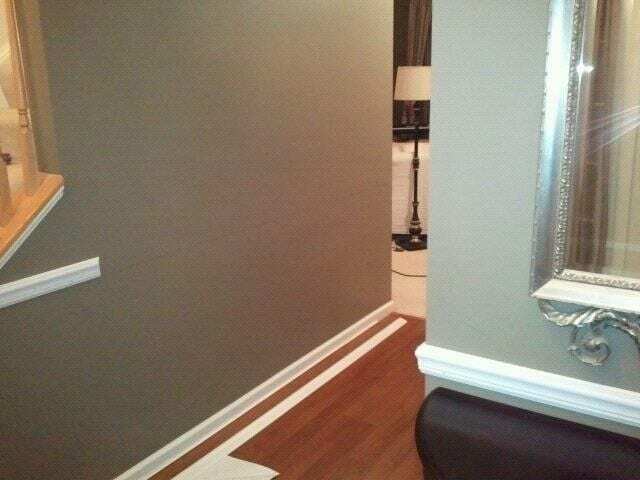 There is always room for wainscoting in my opinion. 🙂 thanks for stopping by. I just came upon your work and was very impressed. 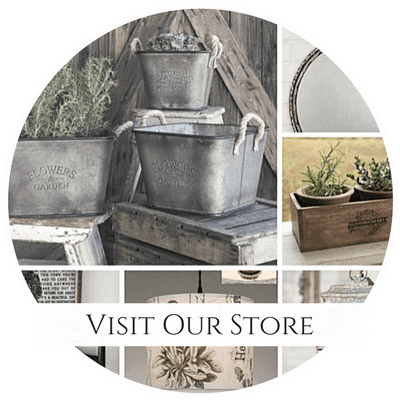 I have been looking at some Wainscotting projects on the web and yours is extremely interesting and inspiring. One question: Did you nail the pieces to the wall using a staple gun or you actually nailed everything by hand into studs? I’d be interested to find out how you did that. Michael, just making sure you received my reply in email. Thanks so much for your comment 🙂 have a good weekend! Thanks so much…and yes, I didn’t invent this tutorial but I certainly had to reference it. It was one of the best out there. Thanks for stopping by! This is something I haven’t tried, but you’ve inspired me. I too think that my foyer is crying out for some architectural detail. How many inches did u go up from the floor??? Thanks Pam! It changed everything in our house. It definitely took our entire weekend but we were so relieved it was over happy with the results! Hi what color is the paint? Great job! 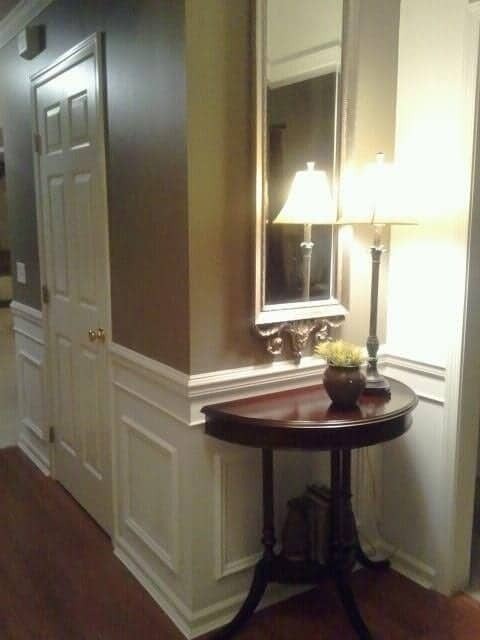 Loved what you did with your foyer, the wainscoting looks amazing. What are the measurements starting from the bottom of the wall to the bottom of the frame? the measurement from the top of the frame to the next trim? The measurement from the middle trim to the top trim? And lastly, what’s the measurement in between each frame? I am doing the same thing in my entry way and up the stairs. I found this on pinterest and checked it out because it is literally what i am in the process of trying to do. But i am wondering what you measured the squares out to be? even the small triangular one at the small part of your stairs. Not sure how to go about figuring that part out. please help!!!! 🙂 BTW- IT LOOKS AMAZING! i cannot wait to finish mine!!!!! Hi Candace, I just wanted to let you know that I got your message and I’ll get back to you asap! I have been wanting to do this for the longest time. Time and a toddler are the only reasons I haven’t yet. Thanks for the inspiration! What color did you use for your wall? I really like it! It looks awesome and I’m considering it for our main floor. One question off the topic above though, where did you get the metal wall hanging in the picture? Hi Lauren, I also replied via email to you, but just wanted to reply to your question here – my husband bought that at Kroger (a grocery store of all things :)) Thanks for stopping by and taking the time to comment! Fantastic Job on this Jeanette! Our builder’s grade entryways are almost identical and the Hub and I have been tackling this project while being stuck inside during this east coast snowmagedon. Your post has been truly helpful and inspiring. One question…can you provide any detail (measurements, cut angles, miter technique, etc.) about the leading triangle piece near the stairs? Thanks in advance. Thanks so much, I can’t believe this project was four years ago already! To answer your question, I believe we had that cut wrong several times. I would recommend a laser level and use that and line it up with the angle of your stairs, then create a line across your trim piece. I do remember us having to take it down and start over with a new piece (our chair rail is actually 2 pieces spliced together on that wall). I hope this helps and good luck! Hello! 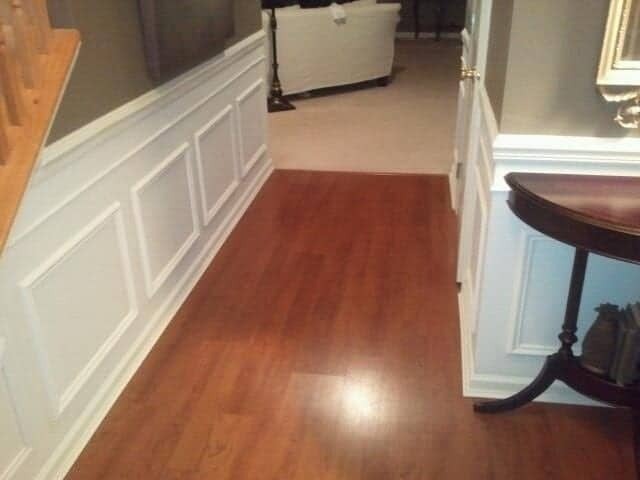 I have been wanting to do wainscoting in my dining room for some time to make it look brighter and more elegant. After finding your post on Pinterest, I was impressed with your DIY work. The foyer looks amazing! Thank you for sharing the information and measurements, posting a tutorial for us to refer to and explaining that it can be inexpensive and an easy upgrade if you attempt it yourself! This busy, mom with three kids is gonna give it a try, thanks to your inspiration! Looks great! I love wainscotting too! Where did you get the 3″ molding and what is it called if you remember? We have tried to find it and so far have failed. 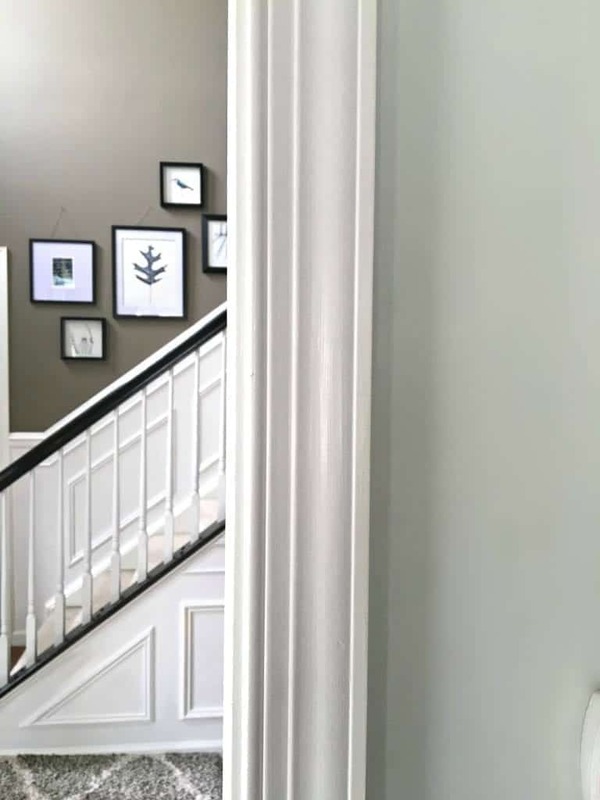 Hi we are still having a hard time finding anything similar to these moldings…you don”t happen to be able to send us a picture of the individual moldings you used? We have searched far and wide and this is exactly what we have been wanting to put into our house as we are restoring it to its original victorian state. Hi! We love your project! 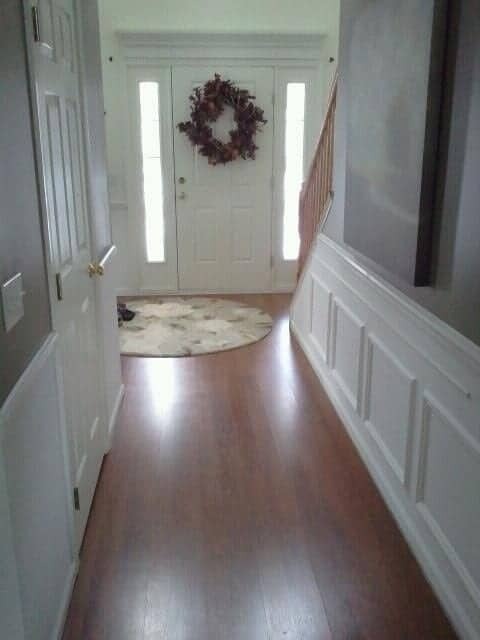 We are adding wainscoting to our living/dining room and wanted to do the same thing you did in our foyer/entryway, but we are nervous our hallway is too narrow and it would feel more confined. Do you mind measuring the width of your hallway and letting me know the distance? Our hallway is 37″ wide from wall to wall. Do you think that’s too narrow? Thank you so much for your time. 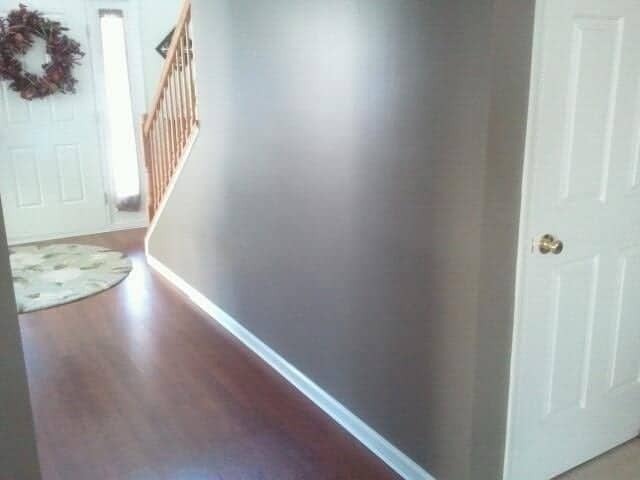 What color is on your walls with the wainscoting? Hi Jeanette, I didn’t see this and emailed you a few min ago, but want to send here in case this is a better way to ask you a question. Can you tell me what finish you used for your background paint and for your paint on your frames? We aren’t sure if it is supposed to be the same as the current chair rail and trim (ours is gloss)? I am just really confused at what finish paint to use. Kristina, let me know if my email answered your questions. I do believe your chair rail should be painted in the same sheen / color as the rest of your wall. Let me know how your project is progressing! Hi, your project looks great! I was wondering if you know what color is on the wall above the wainscoting? I love it! This is very nice! I love your work! I’m also looking into doing this to dining room and eventually ny foyer and going up the stairs.. how do you work around return vents, outlets and regular vents on the wall? 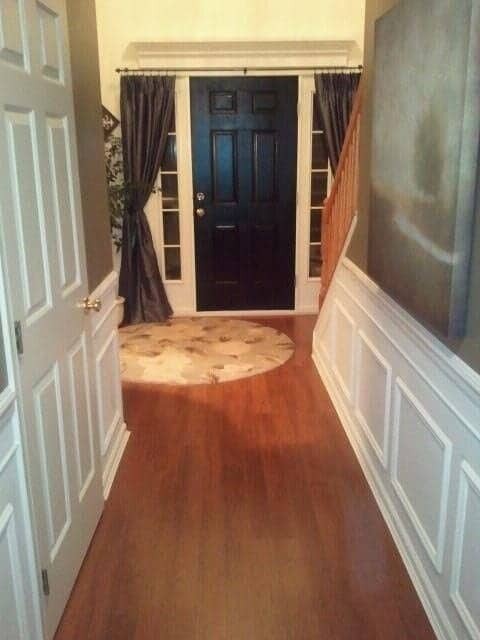 Could you possibly send a close up picture of the way you put the top two moldings together? I also bought all the molding exactly as described here and would love a closeup of all the trim pieces so I know which directions I should be placing everything! Thank you for such a wonderful tutorial! Where did you find the lumbar for your project? I’ve checked Menard’s and Home Depot and neither one carry the same chair rail, strip, nor wood for the rectangles. 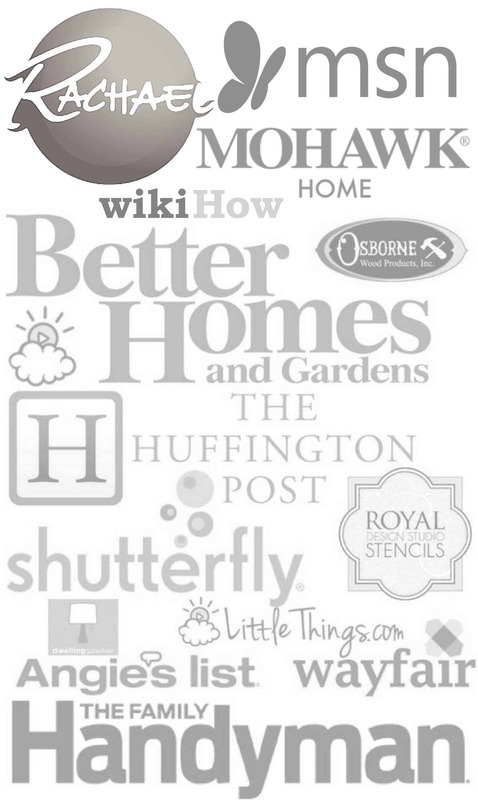 Do you remember which SKU’s you used for the Wainscoting project? And where you purchased your lumbar? Hi Heather! 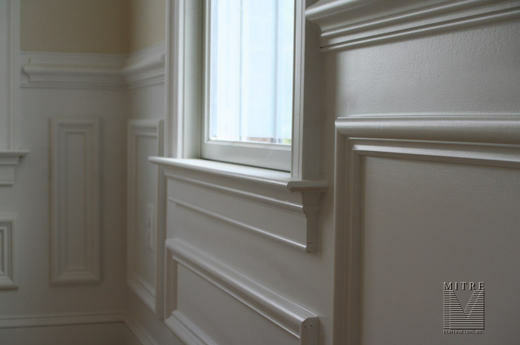 This style of wainscoting has been popular for several decades, so you’re making a good style choice in my opinion. In the post above, there is an image that you can hover your mouse over and it will reveal a little (+) signs Once you do it will point you to the exact size trim we used for each section. I hope this helps! Looks fantastic. Do you know the dimensions of the boxes up the stairs? Would I be able to use an 18 guage Brad nailer instead of a 16 guage finish nailer for this project? Thanks Wes! My husband said the 18 gauge can be used, and suggests 2″ nails. Anything shorter won’t be long enough. Good luck! My husband and I used your tutorial and couldn’t be more thankful for it! We have done everything except combine the top two pieces of mouldings (chair rail plus thin strip). Can you tell us how you spliced these together? We are not sure which way it should be positioned. Thanks! I’m so glad you found it helpful! The top small piece of molding is upside down sitting above the chair rail. We kept moving it around until it looked the way we wanted it. It’s simply glued to the wall above the chair rail.